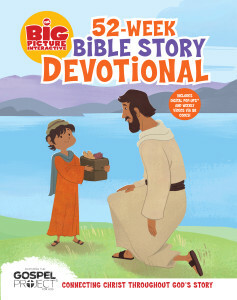 B&H Kids just released the latest Big Picture Interactive family member, the 52-Week Bible Story Devotional written by Anna Sargeant. Anna is a great friend of The Gospel Project for Kids and has helped write content and attend planning conferences. I asked Anna to share her experience of writing this new family resource. 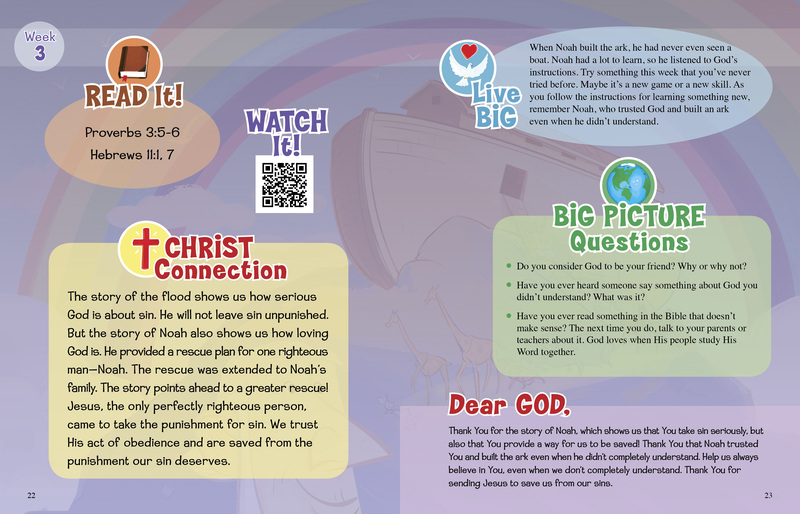 Be sure to check out the sample devotional about Noah after Anna’s bio. You can order the 52-Week Bible Story Devotional in print or in e-reader format. The 52-Week Bible Story Devotional was something I’d never planned to write. But as we know, God often has different plans for us than we have for ourselves. The experience was quite different from curriculum writing, which I was more familiar with when I set out to write the book. While curriculum invites a teacher to instruct in the truth, devotionals invite a reader to discover the truth. The goal of a devotional is for life experience and spiritual reality to collide, for the concrete to meet the invisible and, by the Spirit’s power, for our lives to be transformed in the process. At times, I wrestled with how to invite my audience of kids ages 6-10 into such a space. By God’s grace, I accomplished the task 52 times. And I absolutely loved doing it. I am grateful for the truths God reminded me of as I wrote this book, and I appreciate the challenges it threw my way: meeting tight deadlines, rewriting (and rewriting again! ), and fitting so much into so few words. By the end of the process, I could barely think straight. But it was a good kind of disorientation, because I knew there’s was nothing more I could have given of myself, nothing more I could have offered to the Lord. My hope is that the readers of this devotional would see God more clearly, love God more deeply, and obey God more willingly. I hope their trust in God increases because of what this devotional reveals about Him. Week three’s devotional says, “It’s hard to obey God when it doesn’t make sense. How was Noah able to do it? … Noah had a relationship with God. God was his friend. God had never failed Noah before, so he could believe God now.” This is my prayer for the kids who read this book: that they would have a friendship with God that leads them to love because He loved them first, fight for good because He fights for them, and trust His plan because it is better than anything they could plan for themselves. Anna Sargeant is the Director of Children’s Curriculum of The Austin Stone Community Church where she oversees the writing, editing, and distribution of an in-house curriculum for toddlers and The Gospel Project for Kids for preschoolers and grade schoolers. Anna has known Jesus since she was 5 years old and firmly believes God can give the gift of faith to children. Her heart is to see God raise up many from the next generation to cling to Jesus Christ and to follow Him, wherever He leads.